Consolidating locations helped this PR powerhouse significantly expand her team and seamlessly serve her A-list clients. Del Monaco Foods’ 126,378 square foot facility gives them the room they need to cook up delicious culinary creations for their clients. A fifth Southern California location for our client means vintage Chevy owners around the world can find the custom parts they need to keep their rides looking like new. "Our third project with Le Chat helped them buy a building dedicated for storage and distribution so they can fill large, worldwide orders." San Francisco's "Official Mushroom Man" was able to purchase his previously leased Moss Landing facility, which is perfectly suited for growing mushrooms and his business. With their second 504 loan from us, we helped Power Engineering purchase a Derrick barge and crane capable of handling extremely large marine construction projects. With a larger facility and new equipment, BMA USA can now produce their gourmet oils at a rate of more than one bottle per second. Blach Construction’s new HQ includes a dedicated shop where portions of projects can be constructed regardless of weather conditions, saving time and money. Congratulations to Bear Republic Brewing Company, our client and the SBA’s Northern California 2015 Small Business of the Year! A second project with us allowed this artisan bakery to quadruple its operating space and create more than 20 new, local jobs. SBA Announces Disaster Assistance The SBA has approved more than $30 million in federal disaster loans for California businesses and residents impacted by wildfires in Butte, Lake, Mendocino, Napa, Nevada, Orange, Sonoma and Yuba counties that occurred Oct. 8-31, 2017. BADCO is growing! Please help us welcome Rich Grant to the team. The San Francisco Business Times interviewed Joe Lampe about financing real estate in this tight market. Dane Jasper, our client and Sonic.net CEO, talks about net neutrality. Take a look at our latest economic development report, which includes some fantastic client success stories! SBA Releases 504 Refinancing Rules Learn more. 504 Financing Permanently Reinstated. Please click here for details. Congratulations to Linda Parks, President & CEO of Lixit Corp. in Napa, on being named one of the North Bay Business Journal's 2015 Women in Business award winners! 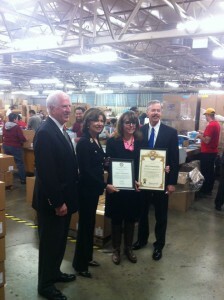 Linda is a long-time client and friend, and is truly deserving of this honor. Congratulations to Mary Wagstaff, owner of Wagstaff Worldwide Public Relations, for being named the SBA’s Los Angeles District Women in Business Champion of the Year. Thanks to the North Bay Business Journal for naming us the top SBA lender in the North Bay for the second year in a row. We are truly honored. Congratulations to Kyle and Lynn Kreun for turning The Inn & Spa Parkside in Sacramento into a beautiful destination. And, thanks to the Sacramento Business Journal for the great article! Here’s a great article from The San Diego Union-Tribune featuring our client, IceTown. It was our pleasure to help them secure the Carlsbad location for their new skating complex, which opens on December 19. Just in time for the holidays! June 4, 2014, Washington D.C.
We were just listed in the San Jose Business Journal as providing the largest SBA loan in Silicon Valley for the last year; a $5.5 million project for our client CS Bio Company, Inc. in Menlo Park. Thanks to Comerica Bank for joining us in helping this great company grow. "Bay Area Development Company's client, Iron Construction, was honored today during an innovative live tweet event that took place at Twitter’s headquarters in San Francisco." 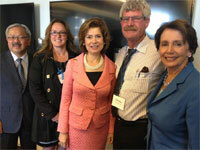 Pictured from left to right are: San Francisco Mayor Ed Lee; Claudia Folzman, COO of Iron Construction; SBA Administrator Maria Contreras-Sweet; Dave Edgar, CEO of Iron Construction; and House Minority Leader Nancy Pelosi. 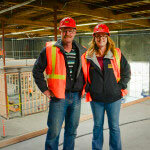 Congratulations to our client, Iron Construction, for being named SBA Northern California’s Small Business of the Year! Learn about this new incentive for veteran-owned businesses! 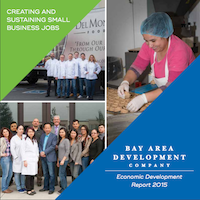 View our 2013 Economic Development Report. Small business is a very big deal to us. We provide 504 loans so companies just like yours can finance commercial real estate at below market fixed rates with low down payments and long terms. That means your ideas and your assets work even harder for you. And so will we–with responsive, personal service and rock solid advice. Because your satisfaction is a very big deal to us!